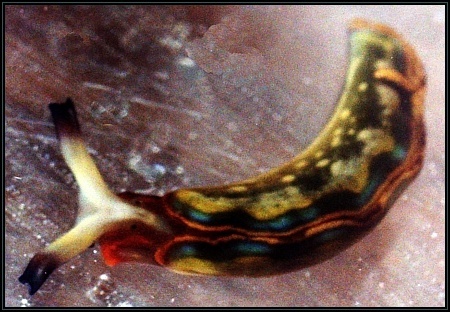 Small sized mollusc generally found in shallow water >1m depth. The body colour is a dark green with white and blue lines on its sides and a yellow line along the parapodial edge. 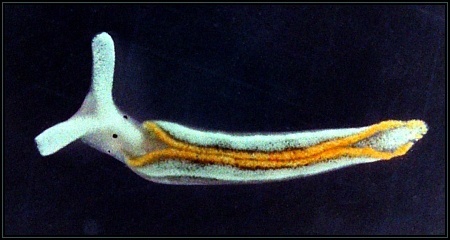 With open parapodia the dorsal part is usually a deep violet. 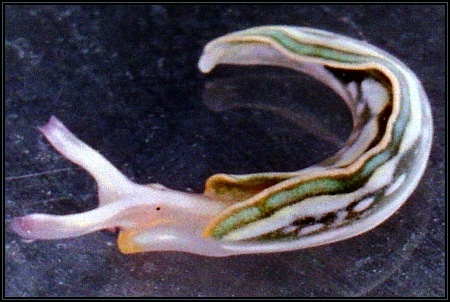 Rhinophores are present as a long inrolled pair, pale coloured at the bottom but with darker tips. Parapodia are generally short but meet over the body and often are kept closed particularly with the animal at rest. No papillae are present on the parapodia. 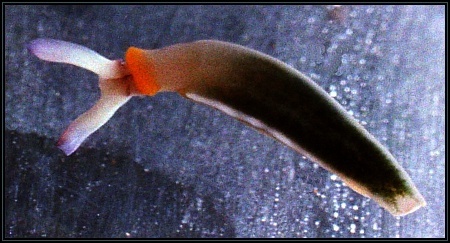 Size range of specimens: 3-20mm, found roaming on algae and bedrock and may co-habit with E.timida but is generally found in deeper water. Specific characteristics: A very common species which is easily distinguished from other elysiids by its bright and vivid colour.